Thirsty front lawn replaced by water-conscious + diverse perennial garden w/ deer-resistant + pollinator-friendly plant varieties. A perennial garden frames the entry pathway in this complete lawn replacement project. 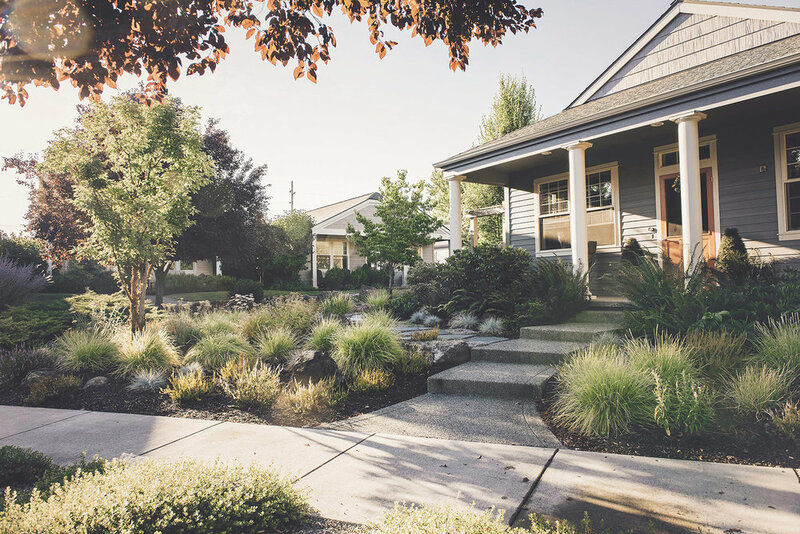 Deer-resistant varieties of grasses, sedge, yarrow + heather create a drought-tolerant lawn alternative with inviting curb-side appeal. A Paperbark Maple [Acer griseum] sheds it's copper-orange bark + will provide exceptional colors in the fall. A flagstone + crushed gravel pathway leads through a pollinator-friendly perennial garden of Creeping Thyme, Autumn Moor Grass, 'Terracotta' Yarrow, 'Silver Knight' Scotch Heather + 'First Love' Speedwell. 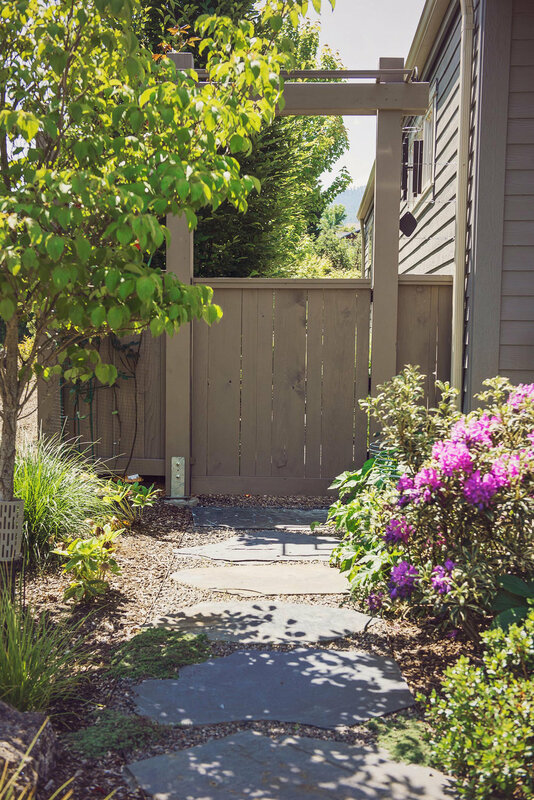 A flagstone path leads to the side yard entrance, marked by a simple ornamental arbor. 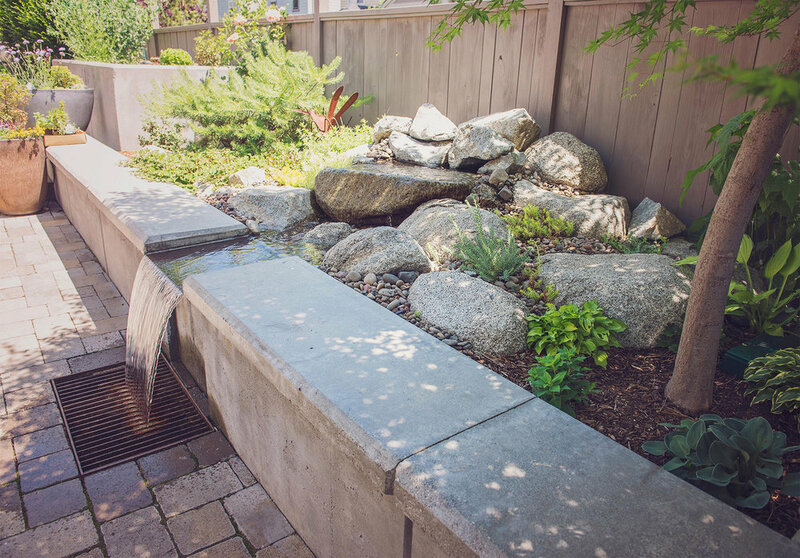 A recirculating water feature constructed of granite boulders, river rock, steel + concrete creates a sense of tranquility within this small outdoor patio. A modern water feature doubles as concrete bench seating, under the shade of an ornamental maple tree. 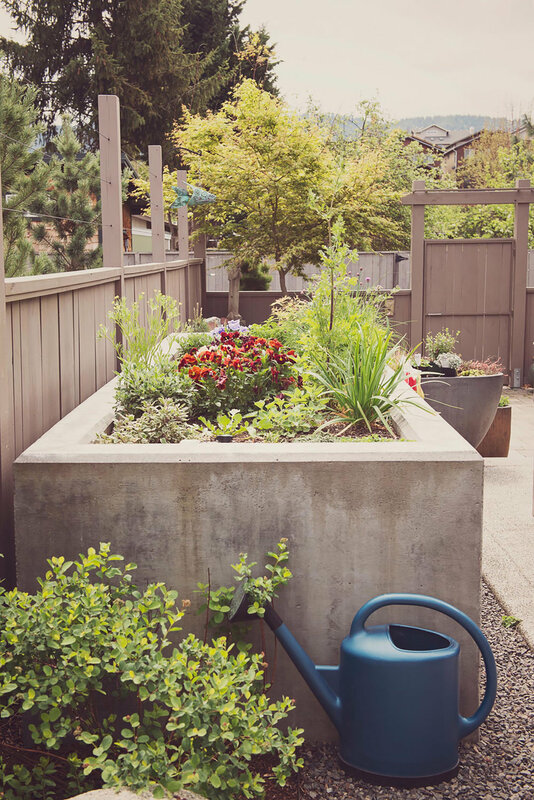 A sand-finished concrete garden bed provides a space for herbs and flowers, perfect for this compact backyard patio. A modern recirculating water feature pours through a steel grate placed within a Holland-style paver patio. A crushed basalt path leads through an efficient but small perennial side garden. Flowering clematis grows on a steel trellis next to this dual purpose garden shed + succulent green roof. Vibrant varieties of Stonecrop [Sedum] flourish, creating a colorful second layer of interest in this compact garden space. A mossy granite boulder is softened by heathers and grasses in this deer-resistant + pollinator-attracting perennial garden. A low-maintenance + narrow side yard lined with European Hornbeam [Carpinus betulus 'Fastigiata'], creates a taller visual barrier and a sense of privacy. 'Paprika' + 'Terracotta' Yarrow [Achillea millefolium] varieties are blended with grasses and granite boulders, creating an inviting perennial landscape. Hardscaping elements of flagstone, mulch, gravel + steel come together in this integrated path system. 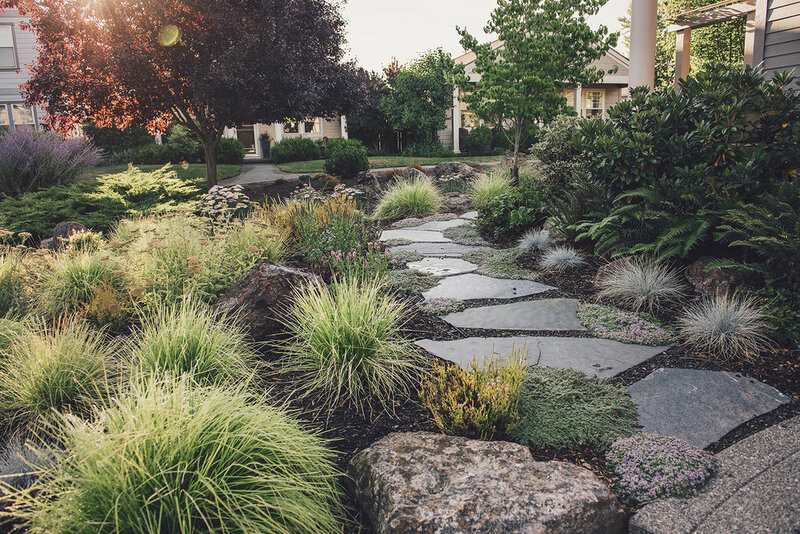 A front garden of Scotch Heather, Blue Fescue, Autumn Moor grass, Western Sword Fern, + granite boulders borders concrete steps. Once a thirsty front lawn, this diverse perennial garden now frames the entry pathway to this modest-modern residence. Drought-tolerant grasses + ferns, Flowering Dogwood + Rhododendron, and pollinator-friendly varieties offer year-round interest. The back and side yards were designed to utilize every square foot of space - a modern recirculating water feature doubles as a patio seat wall; upright trees line crushed gravel and slab-stone walkways while a succulent green roof atop the tool shed adds a second level of planting interest.